My middle school self is kind of freaking out right now. 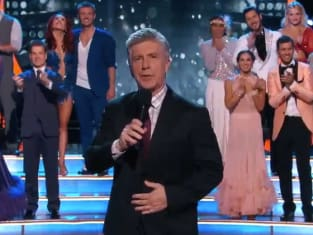 On Dancing With the Stars Season 21 Episode 5, Nick Carter stole the show with his Backstreet Boy's routine to honor his most memorable year. It even included a signature move and a crowd of screaming fans. "Most Memorable Year" is the theme for this episode, which is always among my very favorites. It's a theme that always pulls on the heart strings while also providing dances we've been dying to see all along (see: Nick Carter, The Backstreet Boys). You know we've all been waiting to see that one, and it was epic. Talk about a crowd-pleaser. Among the biggest surprises of the night was Hayes and Emma's contemporary routine. I'll admit, I haven't been paying much attention to Hayes. That is, until now. That contemporary routine was totally mesmerizing. Many of the stories were emotional this week, focusing quite a bit on loss and personal struggles. Of all the emotional stories, Alek's was the most difficult to process. It's the one that makes us feel the need to pause. Alek is here, a part of Dancing with the Stars, because he's a hero. Earlier this year, Alek stopped an active gunman on a train to Paris. Now, he was faced with violence again this past week. The shooting that took place in Oregon was actually at his college, where he would have been taking classes if he weren't currently doing the show. How he managed to dance at all this week is beyond me. Bindi and Derek's contemporary routine was also incredibly emotional. We all remember Steve Irwin, and seeing her dance as a tribute to him was beautiful and heartbreaking. The dance was emotional and flawless earning a well-deserved place at the top of the leaderboard. This week's elimination, sadly, is not all that surprising. Despite Gary Busey's positive attitude and the fact that he's fun to watch, his scores simply haven't been matching up. However it's important to remember what he said after getting the news: "the fact that I've been eliminated is false." Gary went out with grace, reminding everyone that his spirit would remain in the ballroom. Alfonso Ribeiro is taking over! He makes for a fun co-host, that's for sure. I loved Julianne's pep-talk to Paula! Even better is seeing Paula Deen try to whip her hair. It's amazing that Allison Holker is dancing while four months pregnant. I mean, wow. What did you think of this week's episode of Dancing with the Stars? Which dances were your favorites, and how do you feel about that elimination? Share your thoughts in the comments below!